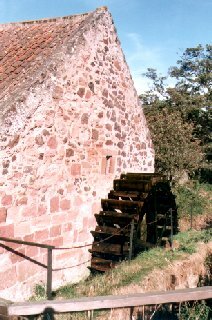 Preston Mill is one of the oldest mechanically intact water-driven meal mills in Scotland. It is situated a half-mile (1 km) to the northeast of East Linton (East Lothian), on the left bank of the River Tyne. There is thought to have been a mill on this site since the 12th century, although the current buildings, with their attractive red pantiles, date from the 17th and 18th centuries. Andrew Meikle (1719 - 1811) was responsible for maintenance of the mill at times during the 18th Century and probably contributed to a major renovation carried out in 1760, which included the provision of a new cast-iron mill-wheel most-likely manufactured at the Carron Iron Works. The machinery seen today is relatively modern, having had to be repaired and replaced following the flood of 1948 which submerged the buildings and effectively brought an end to commercial use of the mill. In 1950, the mill was given to the National Trust for Scotland by the trustees of a local land-owner. Local effort struggled to restore the mill, but the international milling and food group Rank Hovis McDougall provided funds and expertise, and encouraged experienced millers to become custodians of this remarkable mill on their retirement. With its rustic conical-roofed kiln and millpond featuring resident ducks and geese, Preston Mill forms an idyllic composition for artists and photographers. The mill was used as a location in the American time-travel fantasy television series Outlander (2014). Visitors can see the mill operating and view an exhibition on the history of the mill and the life of a miller. Close by is another National Trust for Scotland property, the Phantassie Doocot.